Of all the men who wore blue uniforms in the Civil War, none felt more keenly the purpose of his mission than the African American soldier. Every marching step, every swing of a pick and every round fired at Confederate enemies gave him a chance to strike a blow against slavery and prove himself equal to his white comrades. U.S. Colored Troops were consistently good fighters, performing well in every engagement in which they fought. Even their enemies had to grudgingly admit that fact. One USCT member, William H. Carney, transcended good to become great, and was the first black U.S. soldier to earn the Medal of Honor. On February 17, 1863, at age 23, Carney heeded the call for African Americans to join a local militia unit, the Morgan Guards, with 45 other volunteers from his hometown of New Bedford, Mass. That unit would later become Company C of the 54th Massachusetts Infantry Regiment. There was something unique about the new regiment, commanded by Colonel Robert Gould Shaw; it was an all-black unit with the exception of senior officers and a few senior non-commissioned sergeants. The 54th Massachusetts was created to prove that black men could be good soldiers. Carney was born a slave on February 29, 1840, at Norfolk, Va. His father, also named William, escaped slavery, reaching freedom through the underground railroad. William Sr. then worked hard to buy the freedom of the rest of his family. The free and reunited family settled in New Bedford in the second half of the 1850s. Young William learned to read and write, and by age 15 he was interested in becoming a minister. 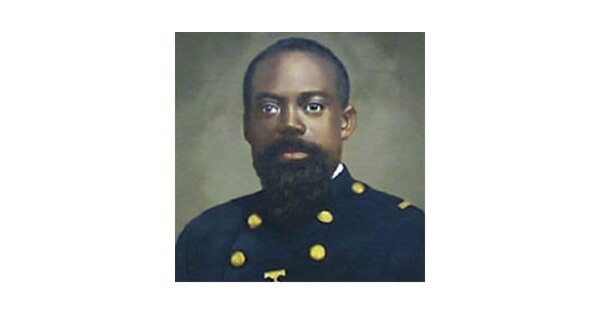 That career change had momentous impact on Carney’s life, as the 54th Massachusetts had a chance to prove its mettle in the July 18, 1863, Battle of Fort Wagner outside of Charleston, S.C. During the fight, the 54th made heroic attacks on the garrison, and Carney’s bravery earned him a promotion to sergeant and the U.S. military’s most prestigious award. Fort Wagner on Morris Island guarded the entrance to the harbor of Charleston. Shaw and the 600 men of the 54th Massachusetts would spearhead the federal assault from a slim strip of sand on the east side of the fort, which faced the Atlantic Ocean. The 54th burrowed into a sand dune about 1,000 yards from Fort Wagner. Behind it was the 6th Connecticut. Federal land and sea artillery bombarded the fort all day long. By nightfall, orders were passed down and the 54th stood up, dressed ranks and attacked in two wings of five companies each. As the men advanced they were immediately hit by a barrage of canister, musketry and shelling from the fort. A bullet struck the 54th’s color sergeant, and as the wounded man faltered, Carney threw down his gun, seized the flag and moved to the front of the 54th’s assaulting ranks. He soon found himself alone, on the fort’s wall, with bodies of dead and wounded comrades all around him. He knelt down to gather himself for action, still firmly holding the flag while bullets and shell fragments peppered the sand around him. Carney surveyed the battlefield and noticed that other Union regiments had attacked to his right, drawing away the focal point of the Rebel resistance. To his left he saw a large force of soldiers advancing down the ramparts of the fort. At first he thought they might be were Union forces. Flashes of musketry soon doomed his hopes. The oncoming troops were Confederates. He wound the colors around the flagpole, made his way to a low protective wall and moved along it to a ditch. When Carney had passed over the ditch on his way to the fort, it was dry. But now it was waist deep with water. He seemed to be alone, surrounded by the wreckage of his regiment. Carney wanted to help the wounded, but enemy fire pinned him down. Crouching in the water, he figured his best chance was to plot a course back to Federal lines and make a break for it. Despite carrying two slugs in his body, Carney kept moving. Shortly after being hit the second time he saw another Union soldier coming in his direction. When they were within earshot, Carney hailed him, asking who he was. The Yank replied he was with the 100th New York, and asked if Carney was wounded. Carney said he had indeed been shot, and then flinched as a third shot grazed his arm. The 100th soldier came to his aid and helped him move farther to the rear. “Now then,” said the New York soldier, “let me take the colors and carry them for you.” Carney, though, would not consent to that, no matter how battered he was. 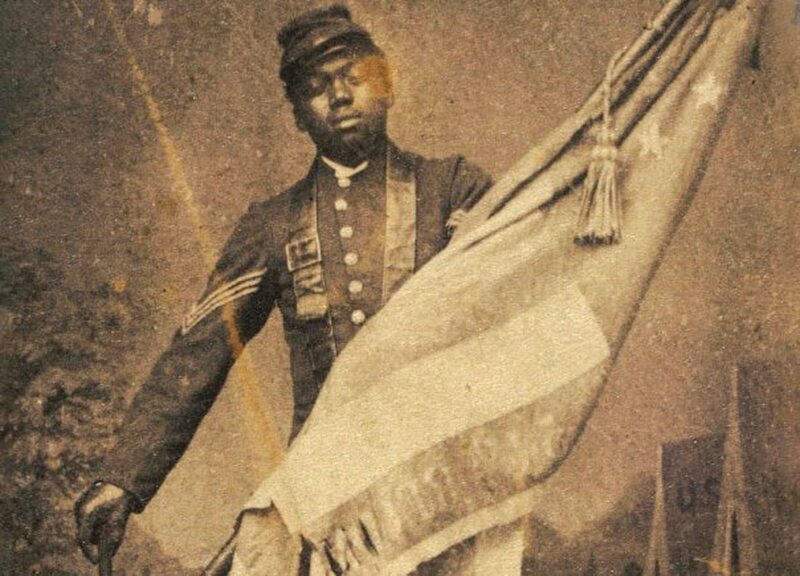 He explained that he would not be willing to give the colors to anyone who was not a member of the 54th Massachusetts. The pair struggled on. They did not get far before yet another bullet hit Carney, grazing him in the head. The two men finally managed to stumble to their own lines. Carney was taken to the rear and turned over to medical personnel. Throughout his ordeal, he held on to the colors. During the battle, Company C of the 54th Massachusetts was able to, for a short time, capture a small section of Fort Wagner. The 54th suffered 272 killed, wounded or missing out of the 600 in the battle. Colonel Shaw was among the dead. Total Union casualties were 1,515 out of about 5,000 in the assault force, while the Confederates had 174 casualties out of about 1,800 defenders. Although the Union forces were repulsed and had to lay siege to Fort Wagner, which the Confederates abandoned two months later, the 54th was widely hailed for its bravery. Like a pebble dropped into a puddle, the regiment’s heroism had a ripple effect, spurring thousands of other black men to join the Union Army. Even Abraham Lincoln noted that the 54th’s bravery at Wagner was a key development that helped secure final victory for the North. William Carney recovered from the four wounds he received at Fort Wagner, and word soon spread of his unselfish actions. When Carney’s commanders heard about his conduct, he was promoted to sergeant. Later in the war, the 54th fought a rear-guard action covering a retreat at the Battle of Olustee, but Sergeant Carney could not participate in that engagement due to the lingering effects of his wounds. Because of his injuries he was discharged from the Army a little more than a year after the battle, on June 30, 1864. Carney subsequently married Susannah Williams, also of New Bedford, on October 11, 1865. They had one child who later became an accomplished music teacher of the New Bedford area. In 1866 William Carney was appointed superintendent of streetlights for the city of New Bedford. He then went to California to seek his fortune but returned to New Bedford in 1869 and took a job as a letter carrier for the Postal Service. He worked at that job for 32 years before retiring. After retirement he was employed as a messenger at the Massachusetts State House, where in 1908 he would be fatally injured in an accident that trapped his leg in an elevator. This article originally appeared in the February 2012 issue of Civil War Times Magazine, a Military Times sister publication. For more information on Civil War Times Magazine and all of the HistoryNet publications, visit HistoryNet.com.